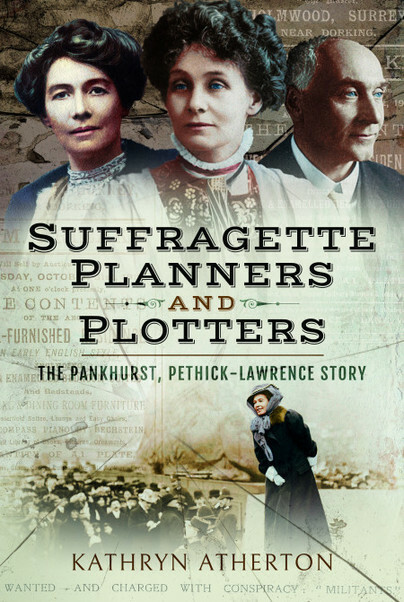 You'll be £15.99 closer to your next £10.00 credit when you purchase Suffragette Planners and Plotters. What's this? Emmeline and Frederick Pethick-Lawrence were an extraordinary couple and theirs is an extraordinary political and personal story. Emmeline was treasurer of Mrs Pankhurst’s militant Women’s Social and Political Union. Fred was the only man to achieve leadership status in the organisation. Without their wealth, determination and skills we might never have heard of the ‘suffragettes’. Emmeline was always at Mrs Pankhurst’s side whilst Fred was the ‘Godfather’ who stood bail for a thousand women. Both were imprisoned and force-fed. They provided the militant movement with its colours, its home, and much of its vision, and it was their associates who initiated the hunger strike and who brought force-feeding to national attention. But in 1912 the couple were dramatically ousted from the organisation by the Pankhursts in a move that has often been misrepresented. This book is a portrait of the couple and their relationship with the Pankhursts, and of their inspirational fight, not just for the vote for women, but for freedom and equality across the world. The Pethick-Lawrences were once as well known as the Pankhursts. But they have been neglected by history. This is the first book to give the Pethick-Lawrences the recognition that their part in the fight for the vote deserves, shedding new light on the development of the militant campaign. It is also the first to address in detail the complexities of the dramatic split with the Pankhursts which has been misunderstood for a hundred years. After an MPhil in 17th Century Studies, Kathryn wrote for the Oxford English Dictionary, she then spent 10 years as a city lawyer. She is currently responsible for exhibitions at Dorking Museum and regularly leads guided walks and speaks on local history in the Dorking area. She has published three books on local history and is currently researching a book on the lives of suffragette campaigners Frederick and Emmeline Pethick-Lawrence and the fight for the vote in the Surrey Hills. Kathy runs guided tours to Ypres and the Somme, and has been able to combine her interest in the Great War with the history of Dorking in preparation of this book.